Pentax just announced a new superzoom camera, the 16-megapixel X-5. It looks pretty much just like a digital SLR except it has a long 26x 22.3-580mm (equivalent) zoom lens and an electronic viewfinder. There’s no digital SLR that comes with a kit lens like that – no one even makes a digital SLR zoom lens that long. There are other compact superzoom cameras with longer zooms but I believe the 22.3mm short end of the Pentax X-5 lens is the widest available on a superzoom camera – maybe even any compact camera. The X-5 also has a full HD video (1920 x 1080 @30 FPS), “Triple Shake Reduction,” a real mode dial, a 3-inch tilting LCD display and a range of shooting modes to satisfy everyone from seasoned pros to complete beginners. Superzoom cameras like the Pentax X-5 are a great option for people who want the control and flexibility of a digital SLR without the cost and intimidation factor. 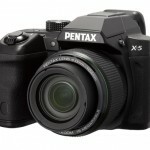 The new Pentax X-5 caught my attention because it looks so much like a digital SLR. 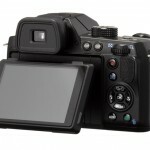 So much in fact, that I thought it might actually be a superzoom version of a digital SLR. I happen to have a Pentax K-30 DSLR sitting right here in front of me so I compared the X-5’s physical specs to the K-30 and it turns out they’re essentially the same size except the X-5 has a much longer zoom than the 18-135mm lens I have mounted on the K-30. So that’s pretty sweet – a 26x monster zoom in the same size package as the K-30 with a kit lens. However, I was disappointed when I looked at the specs and discovered the X-5 has a standard 1/2.33-inch point-and-shoot sensor. Yes, it is a state-of-the-art backlit CMOS sensor but it’s basically the same sensor you’d get in most point-and-shoot cameras right now. Bigger is better with digital camera sensors and unfortunately, the X-5 isn’t going to be able to deliver the image quality that its DSLR-like body promises. If you make a superzoom this big, you might as well take advantage of the size and give it a bigger sensor that that gives it standout image quality. In spite of the small sensor, the X-5 is still a good camera. It’s packed with great features and the long zoom range is excellent – especially on the wide end. As I said at the beginning of this article, I don’t think the X-5’s 22.3mm wide-angle has any competition. At $279.95 (MSRP) the X-5 is also very wallet-friendly. You aren’t going to find another superzoom camera that offers the same combination of zoom range and control for that kind of money. I just wish Pentax really gone for it and given it a more worthy sensor. 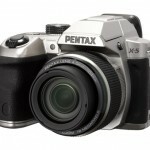 The Pentax X-5 superzoom camera will be available at stores and online dealers next month (September, 2012). The suggested retail price is US $279.95. It will be available in black or silver. Pentax Optio WG-2 GPS Rugged Outdoor Camera And Chest Harness For POV Action! New Pentax K-3 - Best Spec'd APS-C DSLR of 2013?